Walking the halls of the GW anatomy department in 1987, former Himmelfarb Health Sciences Library Director Rochelle “Shelley” Bader, Ed.D. ’93, noticed framed pictures on the wall — images of microscopic anatomy taken and displayed by Marilyn Koering, Ph.D., Professor Emeritus of Anatomy and Cell Biology. “I thought ‘that’s really intriguing, she’s taken her science and made it art,’” Bader recalled. 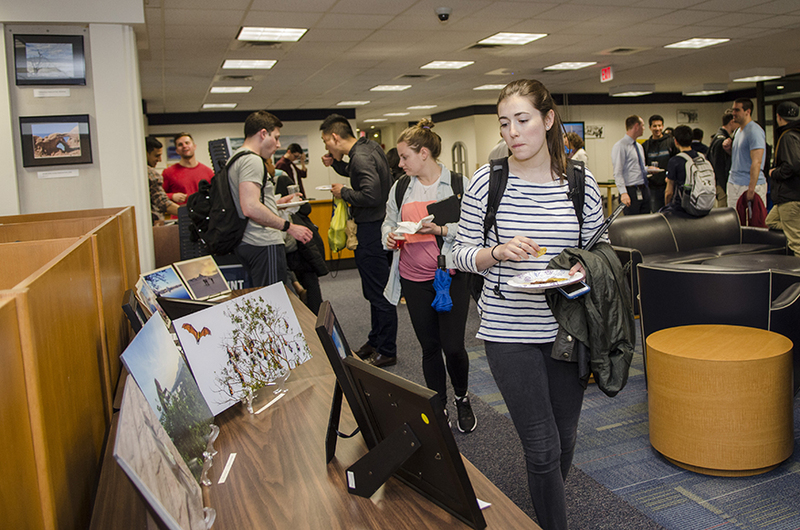 Inspiration struck and led to creation of the first annual Himmelfarb Health Sciences Library Art Show. Now, 30 years later, the spring event still goes strong. The library turns from a place of quiet study to one of artistic contemplation. “I was aware that we had faculty members who … were photographers [and] artists in various media. And knowing the GW student population — if you take a look at the talent that’s displayed every year at Follies — you know there are people who engage in the creative arts,” said Bader, who served as director of the library from 1980 to 1990. This year’s show officially kicked off with a reception on April 6 and is open on the library’s first floor through May 5. More than two dozen pieces of art can be admired throughout the space. Standing out against one of the stark white walls of the library is a vibrant painting featuring a woman, surrounded by swirls of color showing a rising sun and bright green leaves, enjoying the aroma of a pink flower. Snigdha Velugu, research assistant and graduate student at the GW Milken School of Public Health, is the artist behind the work. “Art has always been my safe cove when I am stressed and lose my direction in life,” said Velugu. “I did go through and still to some extent go through depression, and art has been my best therapy. I like to splash a lot of color into my work and that’s a way I feel I add colors into my life. That’s what Bader envisioned for the show.